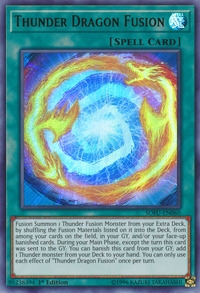 Fusion Summon 1 Thunder Fusion Monster from your Extra Deck, by shuffling the Fusion Materials listed on it into the Deck, from among your cards on the field, in your GY and/or your face-up banished cards. During your Main Phase, except the turn this card was sent to the GY: You can banish this card from your GY; add 1 Thunder monster from your Deck to your hand. You can only use each effect of “Thunder Dragon Fusion” once per turn.